Each year, the Alaska Marine Science Symposium hosts several activities related to scientific communication, education, and outreach. These activities are intended for interested educators, scientists, students, and scientific communicators. With over 800 scientists, policy makers, resource managers, and scientific communicators all convening for marine science in Alaska, it is a perfect opportunity to leverage resources and create opportunities for indviduals interested in scientific communication. AMSS organizers have created an "Ocean Week" centralized around the symposium for educators. All week long, there will be marine-themed opportunities for educators to learn more about the science being presented during the symposium. Details about these activities are below. Take a break from the presentations to watch this exciting new film commemorating the 30th Anniversary of the Exxon Valdez Oil Spill. The film includes historic footage of the spill, new interviews and information on the scientific and habitat work funded by the Trustee Council since the spill. The film is created by the Alaska State Parks (Department of Natural Resources) and will be played on a continuous loop throughout the day, Monday through Thursday. You do not need to attend 2019 AMSS to attend this workshop. Limited to first 25 registrants. Education resources will also be available from Alaska Sea Grant, NOAA, Alaska Sea Life Center, the Alaska Ocean Observing System, and the North Pacific Research Board. Free and open to the public. Each year, the Communicating Ocean Sciences Workshop provides practical information, great speakers and information on current best practices in education, outreach and media. Join acclaimed author and Editor-in-Chief of Hakai Magazine, Jude Isabella (http://www.judeisabella.com) as she will be leading a hands-on workshop that focuses on science writing, creating compelling narrative, while paying particular attention to diction, story, and sentence structure. This workshop is free and space is not limited. Hundreds of scientists convene each year to attend the Alaska Marine Science Symposium—most of whom have outreach/broader impact requirements that need to be fulfilled. 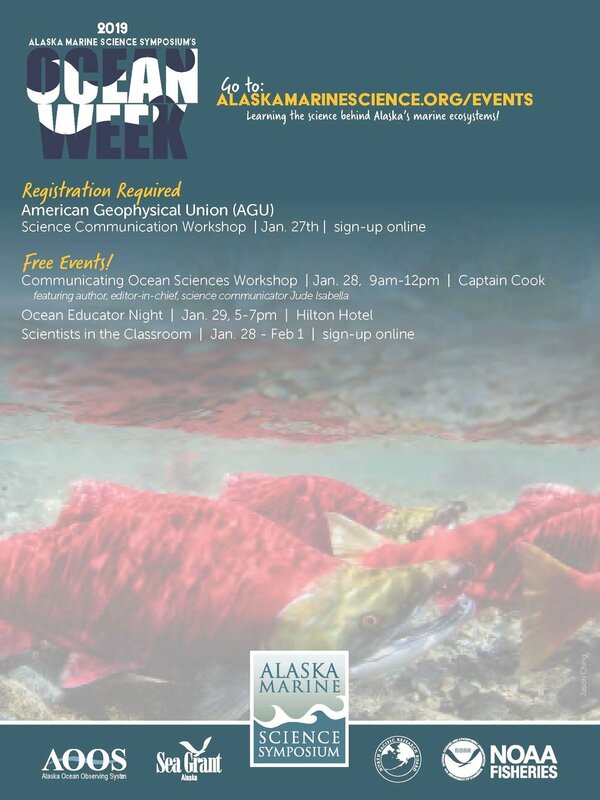 The Anchorage School District and NOAA's Alaska Fisheries Science Center (AFSC) have teamed up to provide classroom opportunities for scientists and teachers to coordinate, share, and connect during Ocean Week. For those interested, scientists and teachers alike, click on the button below.